What exactly is a Faerie? They are in a sense small earth angels, who spend their time helping to maintain the balance of nature. They also help humans they have chosen to help. They hold universal energies but are connected to their main source of energy which is Gaia. I have a fairy and a leprechaun who work and spend time with me. 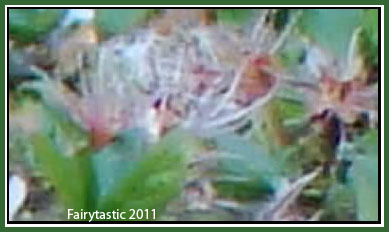 Fairies are a type of being some would call 'land' or 'nature' spirits. Fairies are distinctly Celtic in origin and have a wealth of folklore surrounding them and how people treated them - which usually contradicts the common conception of fairies in popular culture. Actually there are similar beings in many different folklore from around the world, so it is not just a Celtic phenonem. They are called by different names and have different appearances, but basically serve the same purpose. "Faeries are to plants and flowers what spirit guides are to human beings. They nurture them into being all they can be in their highest potential." They can be 'infused' in leaves and flowers. I agree with Norseman - there's nothing supernatural about it - Earth is their home too. 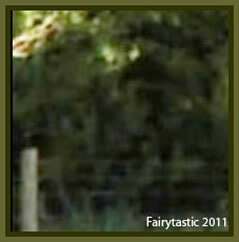 If you want to see some nature spirits, one way is to ask them if they will show themselves for a photo shoot. They seem to love having their photos taken! You might already have some photos of trees or flowers with nature spirits present. Their faces and expressions sure can make you smile! With no physical body restricting them, several can occupy the same space at the same time. I spotted a green-faced nature spirit in a photo of Princess Di and Elton John which may have been in the newspapers. If you scroll down to Princess Di comforting Elton - look to the right of Elton John's head! In some ways yes. Except the Celtic fairies did not serve the type of purpose that many people think. They are also distinguished from other types of land spirits because they behave very differently than other types. I suppose one can call other land spirits "fairies" but it leads to confusion and misunderstanding. Can I ask where you have sourced your information from? HI Amethyst. My information comes mostly from various folklore books, The Secret Commonwealth, by Robert Kirk being one of them (although it's very difficult to read). And other resources that I have plowed through in my leisurely study of Gaelic folklore. Celtic cultures, Irish, in particular have a vast folklore that is still alive today that concerns the "Fair Folk" as they call them. Since the word fairy is usually used in the British Isles. In the superstitions and lore fairies are portrayed as extremely ambivalent beings that are better left alone, because they can be very fickle and cruel. So nearly all traditions revolve around giving them offerings of milk or butter in an effort to keep them in a good mood, otherwise they can steal infants (the whole thing about changelings) or they can spoil the milk of the livestock, or even inflict sickness upon people. Although there are more kind types of creatures who are lumped together with the Fair Folk, like house brownies who were generally benevolent. But fairies differ from other cultures conception of land spirits, in Icelandic Eddas land-elves are usually seen as less violent than the British and Irish fairies. Same with the Germanic landwights. My only problem is that people misuse the term "fairy" as a catch all for various nature spirits. Which I feel a dislike for, simply because it can be mis-informative, or worse, dangerous, if the lore is to be considered reliable. I think some of you people have too much time on your hand, or probably inducing yourselves with some substances that makes you believe in these things. Or do I need to smoke some weed to change my perspective on things ? Now now, while a proper amount of skepticism or objectivity is healthy, there is no need to be derogatory.